Online World of Sports Magazine contains the latest products information about World of Sports products, World of Sports tools, World of Sports industry, World of Sports and World of Sports design intelligence to help World of Sports Business decision makers to find verified World of Sports Suppliers regarding the business roadmap. 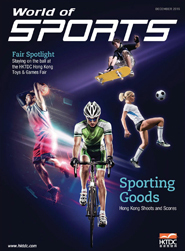 World of Sports Magazine carries the hot products are sport equipment, sportswear and sport shoe. The HKTDC Hong Kong Toys & Games Fair is the largest fair of its kind in Asia, ensuring there is no shortage of top-notch, entertaining products and games for both children and adults on offer.